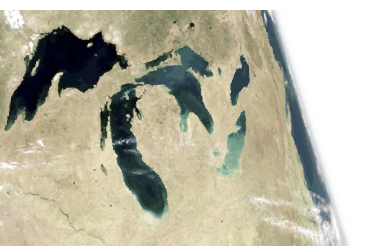 There are five great lakes that form the largest freshwater lake group in the world. Remember HOMES and you can remember their names: Huron, Ontario, Michigan, Erie, and Lake Superior. The Laurentian Great Lakes were formed nearly 20,000 years ago when the earth’s climate warmed and the last glacial continental ice sheet retreated. The glacier, up to 2 miles thick, was so heavy and powerful it gouged out the earth’s surface to create the lake basins. Meltwater from the retreating glacier filled the newly created basins. The Great Lakes attained their modern levels and area approximately 3,500-4,000 years ago. Once vital to fur trading and regional development in the early history of Canada and the United States, the Great Lakes today remain a significant transportation route for iron ore, steel, petroleum, grain, automobiles, and much more. The Great Lakes have a total shoreline of nearly 10,000 miles and cover 95,000 sq miles. The lakes have the largest surface area of freshwater in the world. Each year, large ships called ‘lakers’ carry over 200 million tons in and out of the 2,300+ mile route. The lakes are home to over 350 species of fish. The lakes provide drinking water for 40 million people. Incredibly they represent 90% of U.S. freshwater supply and 18% of the world’s freshwater supply. 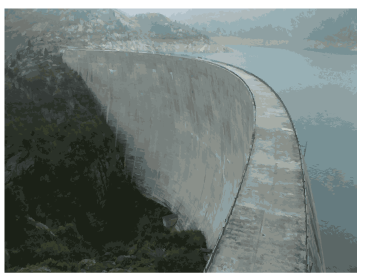 They also provide 56 billion gallons of water per day for municipal, agricultural, and industrial use. The Great Lakes are truly great! Start by remembering HOMES. Print a map of the Great Lakes as a reference and trace and label each lake. Mark the intake and outtake outlets at the mouth of the St. Lawrence River and Chicago Sanitary & Ship Canal. 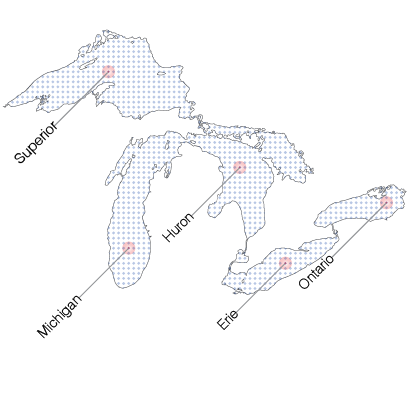 Label the eight states and two Canadian provinces that border the lakes. Next copy the profile section through the Great Lakes. Be sure to label the depth of each lake. Which lake is the widest? Which lake is the deepest? Also record its elevation above sea level. Which way do the lakes drop to sea level? What is the difference between the highest point and the Atlantic Ocean? Be sure to locate the Niagara Falls! The Great Lakes Region and the St. Lawrence Seaway serve the industrial and agricultural heartlands of both the U.S. and Canada. The waterway is the world’s longest at 2,300 miles (3,700kilometers). Every year U.S. Lakers, Canadian Lakers, and Salties (ocean going vessels) move 160 million metric tons of cargo. Ships entering the seaway at Montreal rise more than 600 feet above sea level by the time they reach Lake Superior. The waterway and locks accommodate ships that are 730 feet long, with a seventy-six-foot beam and a draft of twenty-six feet. Major loads include iron ore for steel production, coal for power generation, limestone and cement for construction and grain for domestic use and export. The Welland Canal enables lakers to bypass the Niagara Falls and connects Lake Ontario and Lake Erie. Watch this laker make its way through the Welland Canal. The Soo Locks connect Lake Superior and Lake Huron. The St. Lawrence Seaway connects through the St. Lawrence River, enabling ships to sail from Lake Ontario to the Atlantic Ocean. Complete your section through the water by labeling the distances and the docks and the depths. The St. Lawrence Seaway is vital to the economy of more than 35 million residents of the Great Lakes. In addition to the locks, ships and ports, the seaway employs many different kinds of maritime workers. These include stevedores, warehousemen, freight forwarders, dockworkers, crane operators, vessel agents, dredging contractors, marine pilots, truck drivers, tugboat operators and shipyard workers. 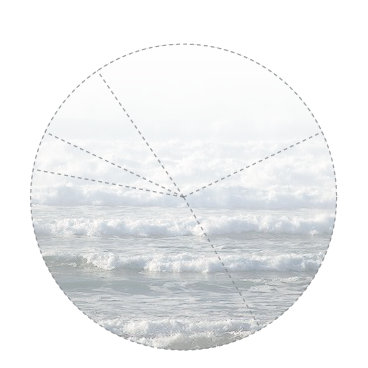 Create a pie chart that records shoreline land use. Other - U.S. 65.3%, Canada 70.6% (Canada includes transportation/communications, recreation, extraction, water, wetlands, forestry, grassland, barren; U.S. includes public, beaches, forests, barren lands.) What are the largest cities on the Great Lakes. Which areas are most populated? Do these areas of development correlate with the Great Lakes AOCs (areas of concern)? After the glaciers retreated, the lakes were home to a rich variety of animals and insects. Populations of many different tribes of Indians settled along the lakes on bays and beaches. Later, explorers from Europe came and then newcomers moving across the United States decided to settle on their shores. With trade, major urban areas developed in Chicago, Milwaukee and Cleveland. With industrial and urban development came pollutants. Water pollution is a change in the chemical, physical and biological make up of a waterway. The St. Lawrence waterway through the Great Lakes has been polluted with sewage, heavy metals, pesticides, urban and agricultural run off and over-development. Acid rain, or airborne toxic contaminants from car emissions and burning of fossil fuels contributes almost 90% of the Great Lakes toxins. Dirt runoff leads to stream sedimentation choking aquatic life. Heavy metals (DDT, dioxins and PCBs or Polychlorinated biphenyls) contaminate fresh drinking water and accumulate in animal tissue like fish. Investigate pollution in the Great Lakes. Which lake is currently the most polluted? Look at Areas of Concern(AOC’s) and at the chart to the right for retention time or time needed to cleanse pollution from lakes. Make a poster about pollutants that are threatening the Great Lakes and measures that the Great Lakes Consortium are taking to counteract them. The Great Lakes Compact is an agreement signed by the Governors of states adjacent to the Great Lakes. It aims to minimize impacts of changes to water flow, quality, and quantity on the Great Lakes by limiting diversions and regionally managing the lakes as a whole system. Research its initiatives, and think about regional water conservation measures. Design a poster, make a powerpoint, or create a video that explains the need for fresh water research and management. What percentage of U.S. Freshwater do the Great Lakes deliver? 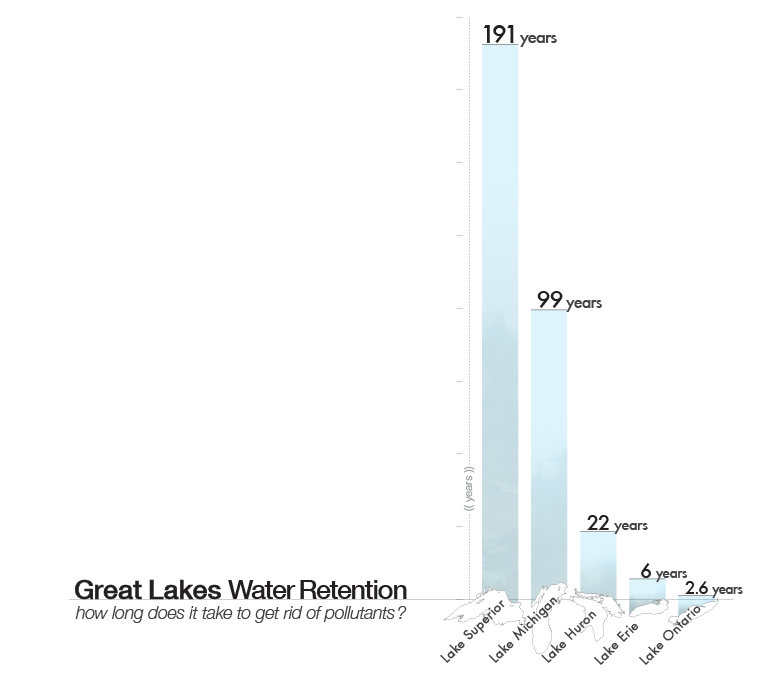 Which lake retains pollutants the longest? What are the four main commodities on the Great Lakes today? What are the large ships called that transport goods on the inland waters? How long is the St. Lawrence Seaway?